After 3 months of writing, mixing, and mastering, my newest song is finally posted. “Ten Lane Traffic” was inspired by the documentary film “Transit Dubai” which I saw at Vancouver’s DOXA film festival. Album art by Tiana Kaczor for "Ten Lane Traffic"
Scenes of multi laned highways cutting through the desert, head and tail lights creating lines of glowing colour, inspired me to play notes in repetition on the piano. The pattern of sound mirroring the endless stream of traffic. Extra mixing with panning and automated volume on a B4 II organ adds some low rumblings of engines zooming by. 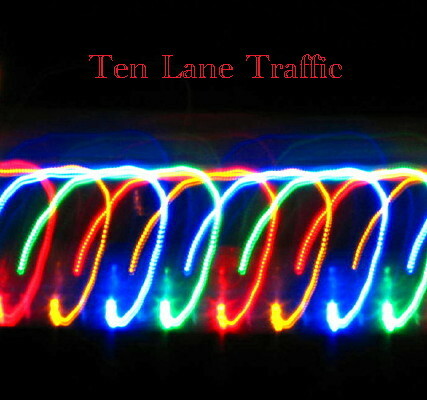 Go to Tiana Kaczor’s ‘Song’ page to listen to “Ten Lane Traffic”. You can also listen to it on her MySpace page, or Reverbnation, where for a limited time you can download the song for free. While you’re there don’t forget to join up and become a fan, which would be greatly appreciated as fans generate points which eventually leads to payments $! Thanks for taking the time to listen to my new song. Comments you have on this piece, or any other music or art, are always welcome. This is a great documentary film about the current state of the music industry. I ended up watching the whole thing this morning, and was very inspired. So, I’m sharing it with you here, and then I’m off to make my own music! As a thank you to everyone involved in Eagles in the City, and the students and staff at James Whiteside Elementary, Tiana offers you a free download of the song “It’s Our World” which she composed for the unveiling ceremony. Enjoy! Please visit my Reverbnation site to download the song. Go to my “Art” page to see full pictures of the sculpture, and my “Links” page to see the Richmond Review article and photo taken at the unveiling. Better late than never, my Christmas present to you is finally here. We’ll call it a Ukrainian New Years present, since that’s what I celebrated on Saturday with a huge feast and 3 hours of dancing at the local hall. You can listen to “Frosted Metal” on my ‘Songs’ page. If you would like to download it go to my Reverbnation site, and it’s available there for free. Thanks for listening, and I always love hearing your comments about my creations, so please write a note to me about this remixed and mastered song. I’ve listened to it so many times that it’s hard for me to be critical. Who knew that scoring an animation clip would take 3 months? But for an artist who likes process as much as product, this was an exercise full of learning experiences. I originally scored and did sound effects for the Monsters Inc clip last spring for my orchestration class. It received good reviews, but wasn’t quite at that professional level yet, sounding a bit quiet and thin. This fall I have been taking a mastering class and learning all sorts of tricks of the trade. Some techniques seem so obvious now, but when one is learning so much, even things that are common sense get lost in the deluge of information. For instance, if a voice is coming from off camera, shouldn’t the sound come from that direction? And if your character is moving across the screen wouldn’t the sound move too? Static is boring, panning is exciting. This demo also includes new tricks for compression, delay, using a flanger, and finding that sweet spot frequency range when working with the EQ on individual instruments. And wow, does adding a cello track ever fill out the score. All this tech talk doesn’t mean a whole lot to the average film viewer, but it’s what makes the difference between ordinary and extraordinary. Like playing the old piano in the school basement, and then sitting down at a Fazioli grand. It’s taking time to train my ears, but I am hearing the differences now. So I invite you to view my latest demo “Monsters Inc”, and send me your comments. It was fun for me to score, and I hope it makes you laugh. Last week I discovered that 2 lines of a song I’d written were exactly the same as an already existing song by a different writer. It’s not in my music collection and I don’t remember hearing it anywhere lately, but somehow I wrote 2 lines into my own song. As an artist I have trouble coming up with original ideas, and I am far from being alone in this. Society values original ideas precisely because they are not easily achieved. Even for the purposes of writing this I am not wholly original: I turn to the web to find quotations on the subject, to use the thoughts of others as fuel for my own. “We are all born originals – why is it so many of us die copies?” Edward Young. Ever look at a 4 year old’s crayon drawing and see the work of a genius? Or are you the type of person who tells the child their cat should have 4 legs not 2, and the grass should be green, not purple? Beatrix Potter once said “Thank goodness I was never sent to school; it would have rubbed off some of the originality.” In our post industrial world conformity seems to be more prevalent than originality. Do not most people choose the route of sameness rather than originality often because they fear being ridiculed, shunned, cast out of the collective group? We are taught everything, from what clothes to wear to what lifetime goals we should achieve. During our current information age is it even harder to have original ideas? “Many a man fails as an original thinker simply because his memory is too good.” Friedrich Nietzsche. We see so much of what others have done our own minds are clogged. No doubt we got to this point in history by taking the ideas of others and building on them, but I can’t help feeling defeated when I think I have an original idea only to find on the internet many others who have it too. So after my discovery of unintentional copying last week I went and wrote new lines, and the rest of my song is still original as far as I know. It still brings me joy, and I hope others will enjoy it too. For now that’s what matters, because in a world where so much has already been said and done “originality does not consist in saying what no one has ever said before, but in saying exactly what you think yourself.” James Stephen. If many others think what I create is fresh and new, and if it stirs some emotion in them, then I am satisfied that my job as an artist has been well done. New Film, Song & Art Pages and a New Look! For those of you who have seen my website over the last month you will notice that I have chosen a new look. A few people commented that the first design was hard to read with the orange on black and small text. I agree that it was hard to find your way around and read. Hopefully this new look will be better. What do you think? Let me also invite you to visit a few new pages that I’ve created to show off my talents. “Art” has a few examples of my paintings and drawings. “Film & TV Scores” has videos that I have scored music to, and for some I also did the sound design ( you know, car sounds in the background, heavy breathing, punches, footsteps, etc.) “Songs” has a few examples of my music that is with, or without lyrics, but has a definite melody and structure. I hope you will enjoy listening and watching, and I would love to hear any comments you may have.